What does scanning and repairing Drive C mean on Windows 10? Lately, every time I've booted up my computer running Windows 10, a dialog box pops up saying "Scanning and repairing: C:/"...Is something wrong with my hard drive? How would I pinpoint what's wrong with my hard drive, or is it the operating system itself? If your computer didn’t turn off properly without warning (the reason could be a power failure, a forced shutdown, etc. ), when you start the machine next time, you probably get this message. If you don’t need to use Windows urgently, you can wait until the scanning and repairing process is done. If you don’t have the patience or time to wait so long, you can bypass the auto-scanning and use other methods to scan and repair the drive manually. Some solution to fix this issue; Check the drive status. On the right side click on View by and make it Small icons, select Security and Maintenance option. 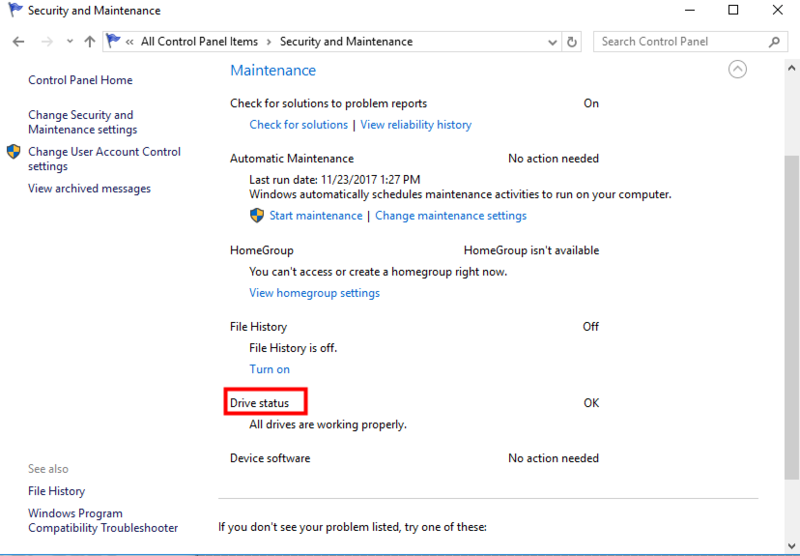 Under Drive status, you may see issues listed here and a link that allows you to click to repair the drive. Click the link.